Lately I've been loving bold, graphic wallpapers like this. IN SMALL DOSES though, like a hallway bathroom or foyer. I love the symmetry of the lamps, the femininity of the desk and chair...overall lovely! I'm liking the bulk of it too, especially that wallpaper. Do you have any idea who it' by? 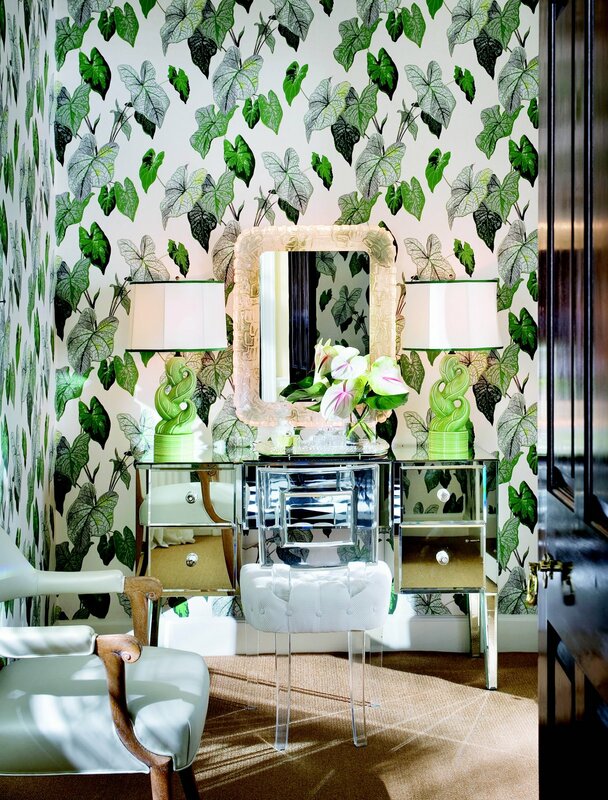 I love me some graphic wallpaper, but a touch too much green for me. I'm still warming to green...some days I think we're getting on the straight and narrow and then other days, we seem back at square one!! I have no idea, rouge.... Anyone? would love that in my bathroom! perfect colors!